A watery passage through a mountain, connecting the Shaded Woods and Brightstone Cove Tseldora. It is the primary home of the Gyrm, a warrior race who make use of adapted weapons, armor, and immense strength. Additionally, the Rat King resides here and has domain over part of this area. The area is named after Pharros the Vagabond. 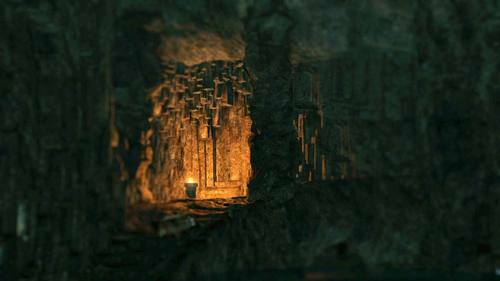 Pharros' contraptions can be found scattered throughout Drangleic, often leading to treasure. There are a large number of contraptions in this area though, more than any other, but most serve to activate traps here. Gyrm: A stocky, powerful race which once dwelt aboveground, they were regarded as inferior by humans and unjustly exiled below. They are amicable by nature but harbor an intense distrust of surface dwellers, particularly humans; in addition many of the Gyrm living in the Doors of Pharros have gone Hollow and become threats to the living. Gyrm Warrior: Warriors of the Gyrm race clad in heavy armor customized for their stout frames. These sturdy opponents can deal massive damage with their improvised Great Hammers while deflecting nearly any blow with the monstrous stone Greatshields they carry. Some have developed proficiency in ranged combat and will throw enormous Greataxes at enemies with frightening accuracy. Dog Rat: Subjects of the Rat King, the origins of these odd hybrid canine rats remain unknown by all but the rats themselves. They inhabit the Doors of Pharros and will bravely defend their rightful realm against intruders. Bowman Guthry (Dark Spirit): A Dark Spirit with a most unusual choice of armaments. Guthry will invade in the Doors of Pharros immediately after someone has passed through the gate into the Rat King's territory. Clad in armor of a Royal Swordsman, could he be a remnant of the Drangleic Army unit dispatched to Brightstone Cove Tseldora…? Royal Rat Authority: A loyal servant of the Rat King and the enforcer of his authority, this gargantuan Dog Rat is also responsible for testing the strength and virtue of visitors to his lord's domain. The design of the Doors of Pharros appear to be modeled after the Giant's Causeway located in Northern Ireland or Fingal's Cave in Scotland. to help those in sincere and dire need. Pharros has been mistakenly credited with. A mask depicting Pharros' contraption. and this mask is no exception.